Doesn't everyone fantasize a bit about vigilante justice? Haven't you ever read or heard of some despicable act of violence and secretly wished you could have the opportunity to make the predator pay? Welcome to the VIGILANTE Series, a growing collection of suspense best sellers best described as thrillers and mysteries which will have you cheering for the assassin as justice is delivered in a clandestine fashion... But remember, this is fiction so it's not a crime... Available in kindle and print books... Book 12 of the VIGILANTE Series Born of old money, attractive and well educated, philanthropist, William Enright had been the picture of the perfect socialite until his arrest and conviction as Montreal's Homeless Killer. After spending nine years in British Columbia's maximum security Kent Institution, William succeeds in executing a masterful escape with only one purpose in mind... Finding Captain Dave McCall and the others who sent him to hell and Getting Even. Claude was born in Montreal, Canada, at a very young age, where he still resides with his spouse, Joanne, under the watchful eye of Krystalle and Midnight, two black females of the feline persuasion. In a former life, he completed his studies at McGill University and worked in various management capacities for a handful of firms over countless years. From there, considering his extensive background in human resources and finance, it was a logical leap in his career path to stay home and write crime thrillers. His first stab at writing fiction was actually in 1995, the result being his first novel, Vigilante. Two others of the same series followed by 1997 but all three remained dormant until publication in 2009. Since, besides writing ASYLUM, a stand-alone, the Vigilante Series has grown to fifteen thrilling installments including a revised version of Nasty in Nice, previously published on the now defunct Kindle Worlds platform. Two of his novels were included in the pair of blockbuster 9 Killer Thriller anthologies, the second of which made the USA Today Bestsellers list in March 2014. Claude has also penned Something's Cooking, a faux-erotica parody and cookbook under the pseudonyms Réal E. Hotte and Dasha Sugah. His books have topped the chart in the Vigilante Justice category on Amazon and over 600,000 copies have been distributed to date. 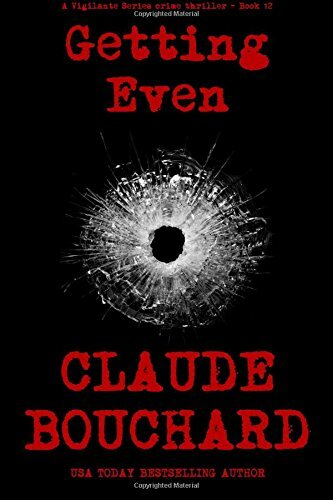 Claude's other interests include reading, playing guitar, painting, cooking, traveling and trying to stay in reasonable shape. You can visit his website at claudebouchardbooks.com which has often been described as comparable to DisneyLand without the rides.